Keep life simple: Ireland, Dublin. Cost of living. Ireland, Dublin. Cost of living. Ireland taxation of an individual's income is progressive. In other words, the higher the income, the higher the rate of tax payable. In Ireland the tax rates for an individual in 2007 are 20% and 41%. For more detailed information please see www.revenue.ie or www.worldwide-tax.com or www.irelandtax.com. I just have a quick look for properties rent and have to say you can rent 1bedroom flat for 1.000 EUR. It might be cheapest but convenience would be considerably worse. For more detailed information please see www.draft.ie or www.myhome2let.ie. 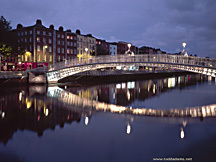 For more detailed information please see www.dublinbus.ie or www.transport21.ie or www.transport.ie or www.softguides.com. You should write more often about new countries and life conditions. Also it can be useful to add information about the crime level and food costs. food cost - it's not big deal. crime level - it's interesting. Never think it over. Just google it and find http://www.movetoireland.com/movepag/misccrim.htm . What is crime level in Switzerland?